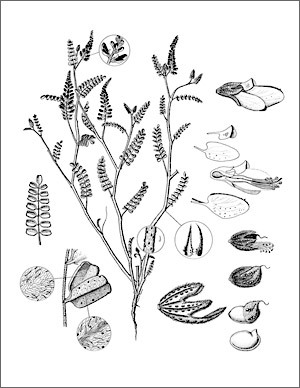 The two botanical illustrations shown here are by Phoenix artist Susan Ashton, one of the artists contributing to the Legumes of Arizona project. The first thing that you notice when looking at Susan’s work is her meticulous organization of all the many botanical components necessary to fully describe the plant. Preparing a botanical plate entails drawing a number of separate elements, including a representation of the habit (the overall growth form of the plant), basic vegetative structures, and details (usually magnified) of the reproductive structures in their various stages of development. 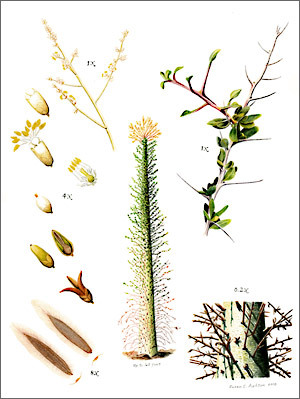 Any distinguishing features that will aid in identifying the plant are also important to include. Condensing so much information into a small format is no easy task, and when it is done as artistically as Susan has done, the viewer, whether botanist or layperson, can truly enjoy delving into the minutiae of the plant. Susan’s background includes a B.A. in Anthropology/Archaeology and a professional career as curator at two historical museums in the Northeast. She developed proficiency with pen and ink while cataloging museum collections and at the same time taught herself medieval calligraphy and illumination. Botanical illustration is an obvious fit for her abilities, and not long after moving to Arizona, Susan completed a Certificate in Botanical Art and Illustration at the Desert Botanical Garden in Phoenix. In addition to her work with the Legumes of Arizona project, she is one of several artists who are documenting rare or threatened plants of the Grand Canyon. This appeared in the December 2013 issue of The Desert Breeze, the monthly newsletter of the Tucson Cactus and Succulent Society.